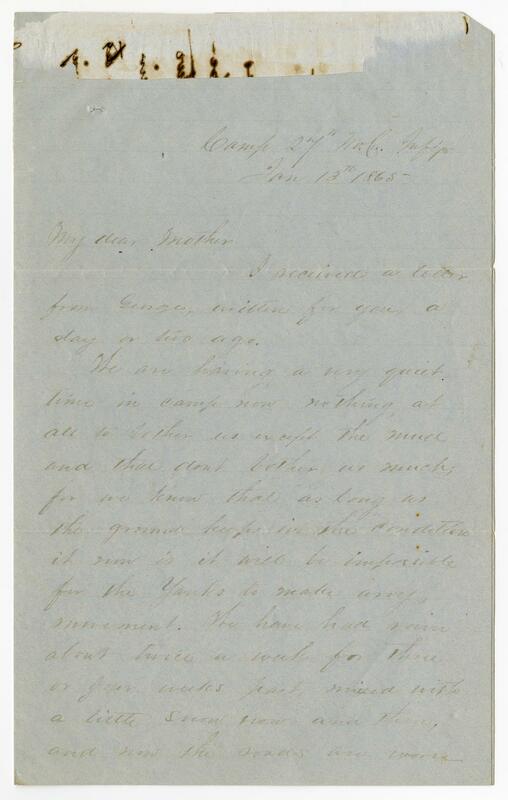 Item Description: Letter dated 13 January 1865 written by James A. Graham to his mother. Graham, a native of Hillsborough, N.C., served as an officer in Company G (Orange Guards), 27th North Carolina Infantry Regiment, Confederate States of America. I received a letter from George, written for you a day or two ago. We are having a very quiet time in camp now nothing at all to bother us except the mud and that dont bother us much; for we know that as long as the ground keeps in the condition it now is it will be impossible for the Yanks to make any movement. We have had rain about twice a week for three or four weeks past, mixed with a little snow now and then, and now the roads are worse than I ever saw them before. 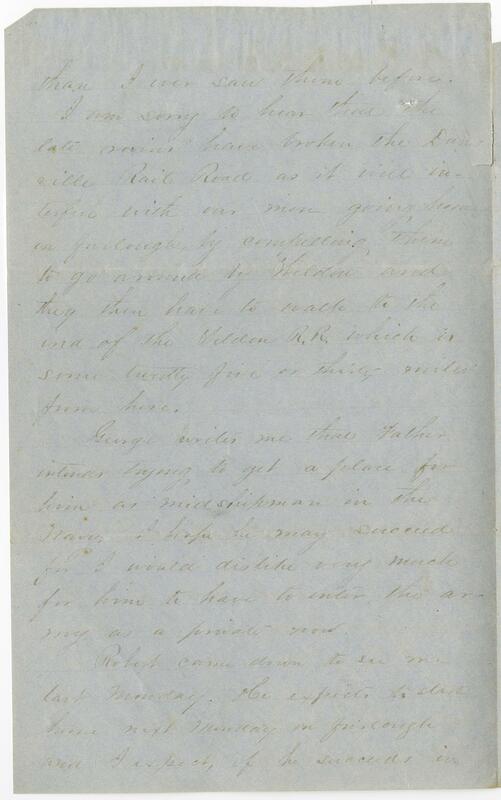 I am sorry to hear that the late rains have broken the Danville Rail Road as it will interfere with our men going home on furlough, by compelling them to go around by Weldon and they then have to walk to the end of the Weldon R.R. which is some twenty five or thirty miles from here. 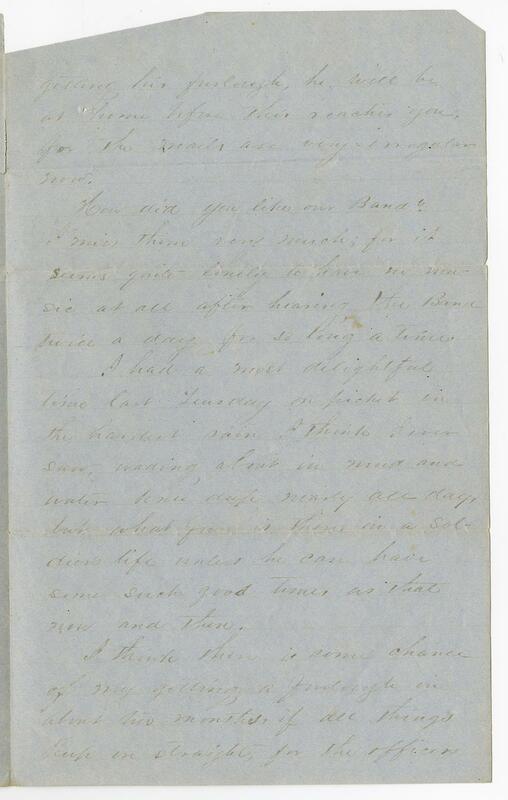 George writes me that Father intends trying to get a place for him as midshipman in the Navy. I hope he may succeed for I would dislike very much for him to have to enter the army as a private now. Robert came down to see me last Monday. He expects to start home next Monday on furlough and I expect, if he succeeds in getting his furlough, he will be at home before this reaches you, for the mails are very irregular now. How did you like our Band? I miss them very much; for it seems quite likely to have no music at all after hearing the Band twice a day for so long a time. I had a most delightful time last Tuesday on picket in the hardest rain I think I ever saw, wading about in mud and water knee deep nearly all day, but what fun is there in a soldier’s life unless he can have some such good times as that now and then. I think there is some chance of my getting a furlough in about two months if all things keep on straight, for the officers of our Regt are getting furloughs pretty fast now and my turn will come after a while. I must close as it is about sunrise and the mail leaves about that time. Love to all. Write soon. 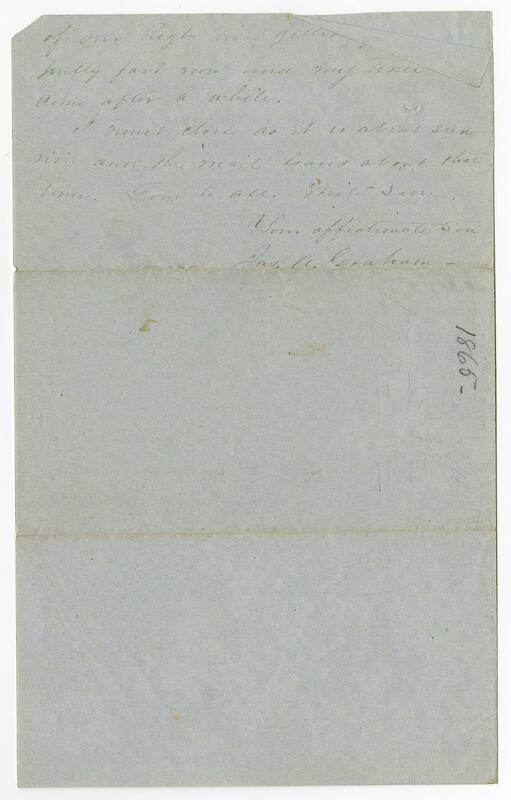 This entry was posted in Southern Historical Collection and tagged 27th North Carolina Infantry Regiment, Danville, Danville Railroad, furlough, James A. Graham, James Augustus Graham, music, Navy, snow, weather, Weldon (N.C.), Weldon Railroad, winter. Bookmark the permalink.